Executive Mosaic’s GovCon Index tumbled Thursday on steep losses among several of its large-cap prime components as U.S. stocks posted a small advance to a new record high close with financial shares the top performers at a 1-percent gain and industrials the largest laggards. Thursday’s decline puts the GCI below 90 points after a three-day stay above that benchmark for the first time since its October 2014 inception. 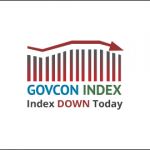 GovCon Index decliners and gainers split even as three of its 11 S&P 500 companies advanced with McKesson Corp. (NYSE: MCK) the top net mover among co-listed shares despite flat movement by healthcare stocks and second in the GCI overall. Defense prime contractors weighed on the GovCon Index with losses of at least $3.00 by four GCI-S&P 500 stocks: Northrop Grumman (NYSE: NOC), Lockheed Martin (NYSE: LMT), General Dynamics (NYSE: GD) and L-3 Communications (NYSE: LLL). Shipbuilder Huntington Ingalls Industries (NYSE: HII) and co-listed Raytheon (NYSE: RTN) registered declines just shy of $3.00 per share, while GCI-S&P company Harris Corp. (NYSE: HRS) posted a loss above $1.00. Boeing (NYSE: BA) ended as the GCI’s fourth-best gainer and the aerospace giant also hit a 52-week high during the session. Defense stocks helped lead a post-election rally in the GovCon Index among industrial stocks and the overall U.S. equity market on investor optimism of military and other domestic spending increases under a Donald Trump administration. The GCI had posted a 13.89-percent gain since the Nov. 8 election prior to Thursday’s open. Science Applications International Corp. (NYSE: SAIC) led all GCI net gainers Thursday after the McLean, Virginia-based government contractor exceeded analyst forecasts for third quarter earnings and reported a company record book-to-bill ratio since its September 2013 spinoff from former parent Leidos Holdings (NYSE: LDOS). Financial stocks led eight S&P sectors higher with three lower after the European Central Bank left interest rates unchanged and extended its quantitative easing program for an additional year to December 2017 with purchases cut to 60 billion euros per month from 80 billion, CNBC reported. The U.S. Federal Reserve meets Tuesday and Wednesday with market expectations of a rate hike there at 95 percent, according to CNBC.